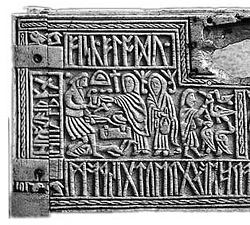 The Anglo Saxon's used a language called Old English and evolved out of Old German - the language spoken in the homelands in West Germany. Old English was in use between the 5th and 11th centuries when it merged with Norman French and produced middle English - the language of Chaucer. Monday Mōnandæg "Moon's day" Dies Lunae "Day of the Luna"
Tuesday Tiwesdæg "Tiw's day" Dies Martis "Day of Mars"
Wednesday Wōdnesdæg "Woden's day" Dies Mercurii "Day of Mercury"
Thursday Þūnresdæg "Thunor's day" Dies Iovis "Day of Jupiter"
Friday Frigedæg "Frija's day" Dies Veneris "Day of Venus"
Saturday Sæturnesdæg "Saturn's day" Dies Saturni "Day of Saturn"
Sunday Sunnandæg "Sun's day" Dies Solis "Day of the Sun"
The Anglo-Saxon year was originally divided into twelve lunar months (which mean 'moons'), but this created a problem because a lunar cycle is about 29.5 days. The results was a 354 day year. After only a few years the lunar and solar months would be out of alignment. To get around this issue the Anglo-Saxons would have leap years and would insert an extra month into the summer. THe summer was one long 2 month period called liða, roughly corresponding to June and July.So the leap years was called Ðriliði (three liðas). The year began on Modranecht, Mothers' Night, the 25th of December. This festival was later adopted as the date for Christmas in the typical pragmatic style of the Church. Its possible that Anglo- Saxons honoured female ancestral spirits on this day. December and January were both called Giuli, or'Yules'. Yule, was the name for the winter solstice period - the shortest days in the year when the anglo Saxons would drive away the drakness by feasting. December was roughly equivalent to Ærra Geola, or 'before Yule', and January was Æfterra Geola, 'after Yule'. February was known as Solmonað or 'Mudmonth'. March was Hreðmonað possibly named after a goddess Hreða of which we know little. April corresponded with the lunar month of Eostermonað named again after an obscure deity called. This month has survived into modern times as the word Easter which is typically celebrated in March or April. May was Ðrimilcemonað, 'month of three milkings'. "So called because in this month the cattle were milked three times a day," commented the 7th century historian Bede. As has been said June was known as Ærra Liða, 'first' or 'preceding' Liða and July was Æfterra Liða, 'following Liða'. The word Liða might mean sailing as this was the time of year when sailing was easiest due to calm weather. So this was the summer sailing season. August was called Weodmonað, 'weed month' probably because weeds and crops wwere growing fast. September was Haligmonað, 'holy month'. It was a time to give thanks to the gods for the fruits of the summer harvest. Harvest festivals stll survive in many countries into the modern period. October was Winterfilleð - the begining of winter. November was called Blotmonað. This many have been a month of sacrifices BUT more likely it was the time of year when the animals would be saluaghtered and preserved for the coming winter feasts.